LA Kuehlke’s “Redemption.” A battle for his soul and a chance for redemption. How do you keep going after the one woman you always believed you would be with forever gives her heart to someone else? Paul Henry Johnson’s “Scrolls of Darkness.” Face to Face With the Spirit of Evil…Corporate attorney Brent Michaels has a good life in Century City: he’s successful, good-looking, and well-respected. But he’s getting a little bored with the same old routine. Little does he know how completely his life will change when he receives a letter from an old friend of Brent’s deceased and estranged father. 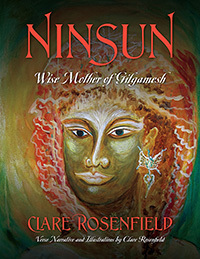 Clare Rosenfield’s “Ninsun.” This dramatic verse is a riveting sequel to the ancient Sumerian epic of Gilgamesh. As king of Uruq, Gilgamesh comes to realize that it was his own hubris which precipitated the death of his best and only friend, Enkidu, whom his wise mother had predicted he would meet. After having lost the elixir of immortality he had journeyed so far to obtain, in Ninsun, he returns to his kingdom, bedraggled and unrecognizable, but in need of his mother. How did she become so wise? Janie Doyle-Mansfield’s “Murphy’s Town.” There is no doubt in the world how much love is between a father and his daughters. He will protect them at all costs. This father will prove that beyond actions and words. Colonel James Michael Murphy, Jr. comes home from one war to fight another one at home. No one could have prepared for the hell that is about to rain down on the Murphy family.